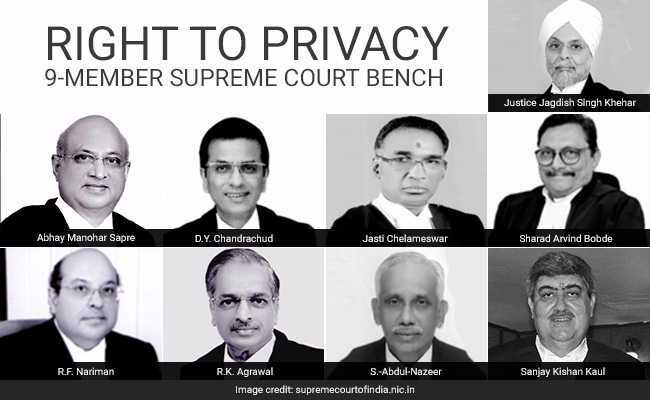 The nine-judge Bench Supreme Court judgement has today pronounced in the “Privacy Case” by upholding the Right to Privacy as one protected by Article 21 of the Constitution of India. The Government welcomes the view of the Supreme Court, which is consistent with all the necessary safeguards that the Government has been ensuring in its legislative proposals which had been approved by Parliament. The issue of personal liberty had a chequered history during the previous Congress Governments. Immediately after the Constitution was framed, the Congress Government at the Center had consistently maintained that personal liberty could be denied to an individual by any legislation irrespective of the reasonableness of that legislation. The Congress Governments had consistently argued that privacy was not a part of any constitutional guarantees. In fact, during the internal emergency when Article 21 was suspended, the Central Government had argued before the Supreme Court that a person could be killed and deprived even his life (let alone liberty) and he would still be remediless. The Finance Minister was referring to the situation where the UPA Government created an AADHAR without any legislative support. The present Government did exactly the opposite. It gave a legislative support to AADHAR and incorporated in law special safeguards with regard to privacy. It has also assured the Supreme Court that it will soon be coming out with a data protection law for which a committee headed by Justice Sri Krishna, a retired judge of the Supreme Court, had already been appointed. Today’s judgement of the Supreme Court is a welcome judgement in as much as it strengths the Fundamental Rights and personal liberty. The judgement reads that personal liberty is not an absolute right but liable to the restrictions provided in the Constitution which will be examined on a case to case basis. The Government is of the clear opinion that its legislations are compliant with the tests laid down in the judgement. The Supreme court has stated that ”…requires a careful and sensitive balance between individual interests and legitimate concerns of the State. The legitimate aims of the State would include for instance protecting national security, preventing and investigating crime, encouraging innovation and the spread of knowledge, and preventing the dissipation of social welfare benefits.” The Government is committed to this object.